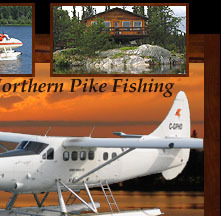 There are many places where you will find Northern Pike in Northern Saskatchewan Lakes. Generally, you will find small to medium size pike in the back of bays where there is thick weeds, lily pads and wild rice. The small to medium size pike are feeding on small minnows, bugs, frogs and each other. When you come out to the edge of the weeds, the pike will get bigger because the pike have the food of the bay to their back and also have the chance of taking a small Walleye swimming by the outside of the weeds. So where are the big pike? Big pike generally do not bother with small minnows, frogs and bugs. Their main food is Walleye. The big pike will hang out where they can ambush Walleyes. The prime ambush area is points leading into bays. They will also hang around rocky points, shoals, islands and other places where there are Walleyes. The best place to get a big trophy pike is at the mouth of a stream or river, narrows between islands and water-flow between lakes. The big pike just sit there waiting for Walleyes to swim through. Walleyes tend to migrate around a lake all year, whether it's moving to find cooler water, deeper water, more food or even finding their spawning grounds. Of all the game fish you can catch in Saskatchewan, Northern Pike are the easiest. Pike will hit just about any lure. The most popular lures for Pike are the "red & white" and the yellow "five-of-diamonds" DareDevils. Pike also hit jigs, Rapalas, jerk baits, large spinner baits, Mepps Musky Killers and Thundersticks. If you are flyfishing, the best flies are the Barry Reynolds Pike Bunny and the Rabbit Strip Pike Bunny. Some of the biggest pike are caught with small jigs while Walleye fishing. It makes sense because the big pike will patrol the outer parameter of the schools of Walleyes. In Northern Saskatchewan, there are generally three types of water. Some lakes are so clear that you can see the bottom 80 feet down. Other shallow lakes can me murky or muddy for days or weeks after a big storm. Many lakes have a wine-red color, which is caused by dissolved iron in the water. With clear water, the red and silver color works best. With muddy or iron-rich water, a yellow Five-of-Diamonds DareDevil seems to work better. In muddy or iron-rich water, rattle baits are even better as the pike can locate the lure by sound. Do you have a Rapala that's all chewed up or the little plastic fin broke off? You don't have to turn it into a key-chain or throw it in the garbage. It's still very useful. Nothing gets a big monster pike PO'ed more than watching another fish trying to eat. Northern Pike are extremely competitive and like to assert their dominance in the food chain. When a pike sees a fish chasing another fish, it's time for lunch. With this in mind, take the hooks off your broken Rapala. Then attached a black steel leader. Then attach another leader to the back of the Rapala with a spring-slip-ring. Then attach your DareDevil or what ever you want to use. This rig is another way of triggering that animal feeding instinct. It's an old Muskie fishing trick. If you hold a northern pike or walleye up by it's eye sockets like they use to do in the old days, you squeeze their optic nerves into their brain and they die a slow death. If you have touched a gas tank, gas line or get gasoline on your hands, scrub (wash) your hands with sugar. After you have put bug spray on, wash your hands with salt. Do this before you touch your lures to minimize transfer of undesirable scents. This will maximize fish strikes.